As first-year Master of Urban and Regional Planning students, Bianca Juarros and Esteban Doyle wanted to find meaningful ways to get involved with the UCLA campus community. The Luskin Food Mentorship program provided a way for them to do just that, while also exploring interesting and relevant topics. Lead cook Theresa Farthing of L.A. Kitchen chats about the food preparation effort with UCLA Luskin students such as Esteban Doyle, wearing an apron and orange shirt. The program is a part of a 10-week series on food called “Off the Table,” which is a combination of inspiring lectures, movie screenings and hands-on activities centered around food issues. 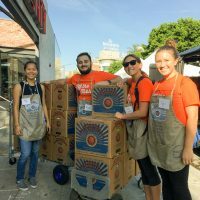 The program matches graduate students in the UCLA Luskin School of Public Affairs with undergraduate students pursuing the Food Studies minor. 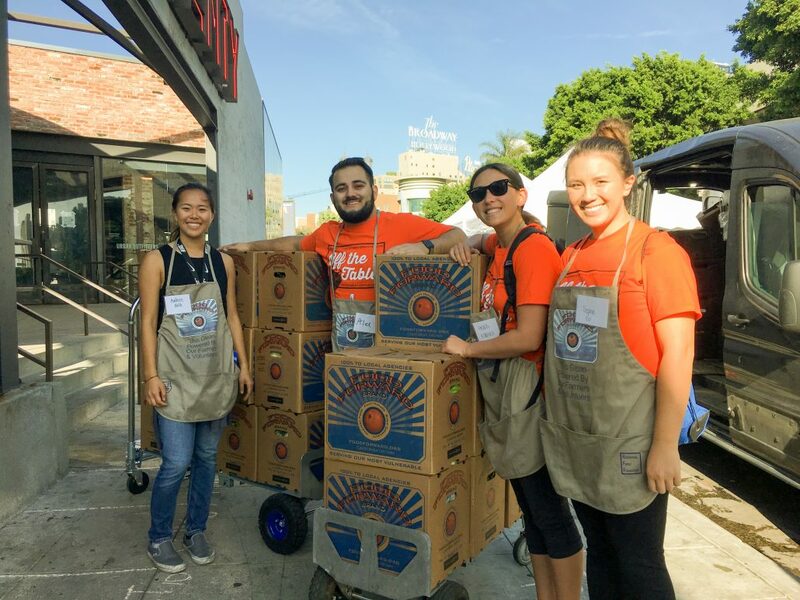 Pairs of students such as Juarros and Doyle are then tasked with coordinating a volunteer event at a local organization focused on food issues in Los Angeles. 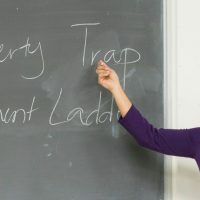 It offers a way to share knowledge, foster connections and make a meaningful impact on the greater community. 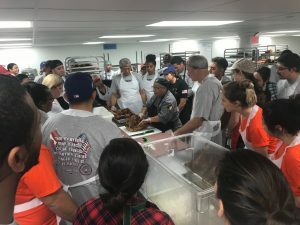 I had the opportunity to attend the “Off the Table” event called “Breaking Bread: Community Building with Veterans and Farming,” which delved into the often-unseen struggles faced by veterans after returning back home from a tour of duty — especially in terms of fostering social connections, finding newfound purpose and engaging in the healing process. The panel discussion opened my eyes to the vital importance that community gardens play in the reintegration process, especially among the UCLA community. I was moved by the stories shared by the panelists, many of whom were veterans themselves, and inspired by the efforts to re-create a veterans garden in Westwood. This was just one of many insightful “Off the Table” events. In partnership with undergraduate students in the mentorship program, Esteban and I also coordinated a volunteer event at the L.A. 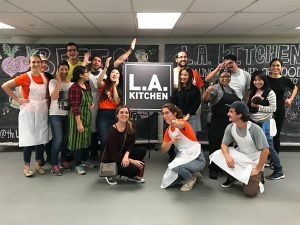 Kitchen, which is an organization that employs formerly incarcerated individuals and emancipated foster youth to prepare food for community service organizations such as homeless shelters and senior centers. After promoting our event through our various networks, we were able to register a total of 15 people to volunteer. 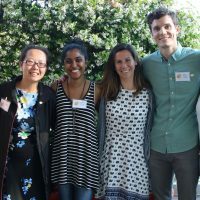 We recruited a mix of undergraduate and graduate students from various schools at UCLA. On Saturday, Nov. 18, our volunteer group went to the L.A. Kitchen to volunteer with food preparation. Because this was the Saturday before Thanksgiving, we had the special opportunity to help carve turkeys. One of the L.A. Kitchen staff members, a recent graduate of the culinary education program, demonstrated to all the volunteers how to properly break down a turkey, removing as much meat as possible. After the quick tutorial, we all set out to work at various stations. 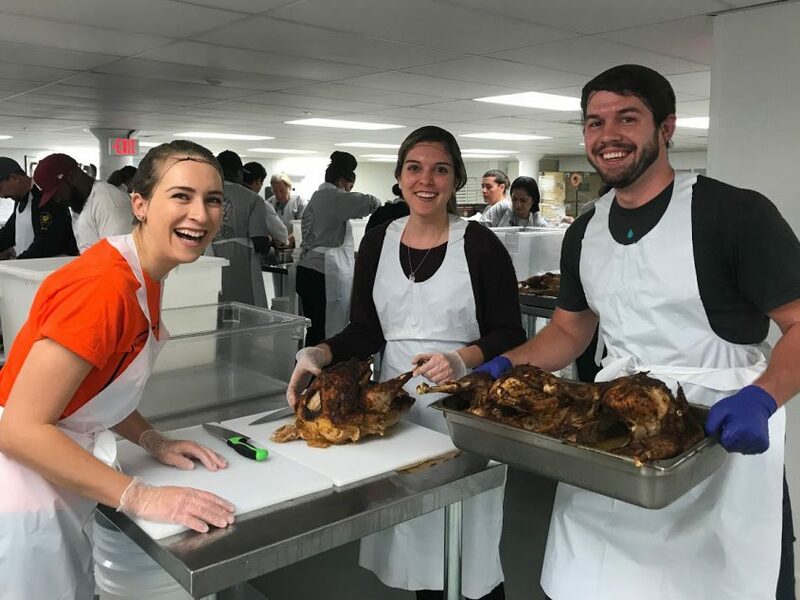 We handled hundreds of turkeys! Working side-by-side with other students was a wonderful time. People shared their favorite Thanksgiving memories while de-boning turkey legs. 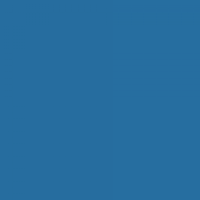 With everyone talking, sharing and laughing, it hardly felt like work at all. Time flies when you’re having fun! We finished all the turkeys in record time. It helped, of course, that another large group — volunteers from a local electrical union — was volunteering that morning as well. Going forward, we hope to maintain a close relationship with L.A. Kitchen. All the students who volunteered said they had a great time and would love to do it again. The L.A. Kitchen staff members mentioned wanting to strengthen ties with the UCLA community too. 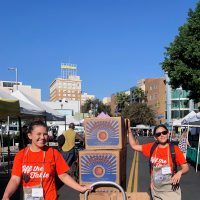 We hope to continue planning more volunteer experiences with the L.A. 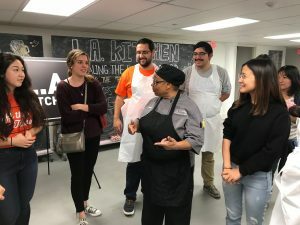 Kitchen and bring in more UCLA students to share the wonderful experience. On Dec. 2, 2017, UCLA Luskin Master of Urban and Regional Planning students Alexander Salgado and Ana Kobara joined with UCLA undergraduate mentees Audree Hsu and Sophie Go as part of the UCLA Luskin Food Mentorship program to participate in a volunteer effort with Food Forward. 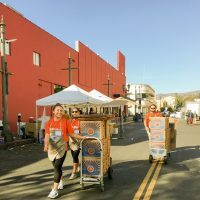 Food Forward is a nonprofit organization that works with multiple farmer’s markets in Los Angeles to collect donated food from vendors to pass along to organizations in need of fresh food. 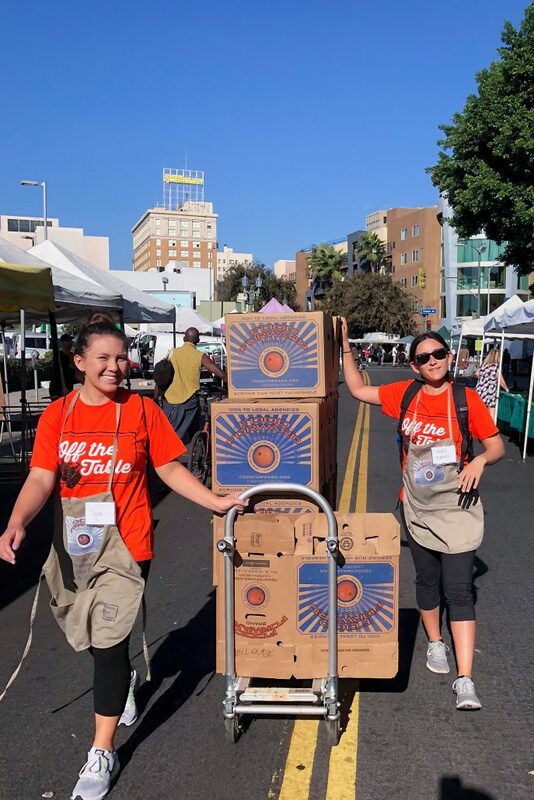 Throughout the day, the students walked a farmer’s market in Hollywood and delivered empty boxes to vendors that could fill them with produce. 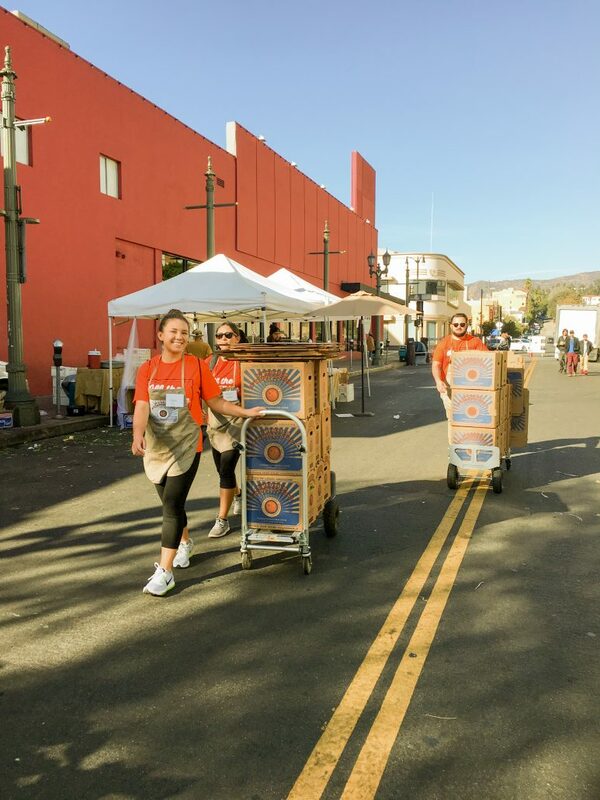 For the day, the student volunteers collected and organized more than 1,700 pounds of food, which was then delivered or picked up by various organizations in need.